"I forgot to tell ya�if you catch any squirrels�give 'em to me!" Motorama is almost inexplicable. A movie about a foul-mouthed kid who goes on the road and tries to win a large sum of cash, all the while facing increasingly surreal obstacles sounds like it could be interesting, but in this case, it isn't. This movie is marked by bad acting from the main actor, a silly plot, and poor directing. The only lasting impression this movie makes is that it has so many cameos from cult actors to better-known figures. The film opens with Gus (Jordan Christopher Michael) working on something in his garage, while we hear his parents arguing in voice-overs. The next thing we know, he's driving down the open highway (he was building an apparatus so he could reach the pedals of a car in his garage). It turns out he's playing Motorama, a game where, if you buy five dollars worth of gas from participating gas stations, you get a card. If you get any combination of cards that spell "Motorama," you are eligible to win $500,000. Most of the movie is spent showing Gus' (supposedly) interesting detours, from run-ins with the law (in the form of a sheriff played by Robert Picardo), to his stay at an motel with a strange clerk (the legendary Jack Nance), to some angry bikers (Meat Loaf among them). Will Gus win the Motorama game? Will he get caught by the police? Will you keep reading this review? The world may never know! The weirdest thing about this film is that it got made at all. Could you imagine the pitch meeting for this? "It's about a kid who�uh�steals a car�curses a lot�gets tattooed against his will�has one eye beaten into uselessness�and, uh�.generally gets treated like dirt by everyone he encounters. Now, where's my money?" Perhaps the director saw the script and thought it was too quirky to pass up. However it got made, the result is a disjointed mess. The overarching story is distressingly thin (collect all the letters, woohoo! ), as is character development. I'm sorry, hearing parents arguing isn't enough to tell me exactly why this kid is doing what he's doing. The tangential stories that occur on Gus' way to winning his money are woefully overdone. It's obvious that everyone he meets is weird, period. Okay, so that suddenly means that we expect this from every character along the way. When a couple kidnaps him, and the man puts on women's makeup, it's not shocking or surprising, but everyday and banal. When Gus drives into "the last state" (the film takes place in some alternate country, complete with currency that looks like a mix between Monopoly cash and Canadian bills), he is treated to a host of seemingly disturbing images: men shooting up, Bishops being shot, and the KKK burning a cross. That's not surrealism, that's poor use of shock tactics. The only good things about this sorry excuse for entertainment are the cameos. And, no, I don't mean Drew Barrymore, who appears on screen for five seconds at the most. I'm talking about Flea, Jack Nance, Meat Loaf, and whole host of actors that will make you sit for hours trying to remember their names, because you sure as hell know their faces. Of these, Flea is the least substantial, playing a bus boy with little mind of his own. Meat Loaf plays a stereotypical mean biker, but is still memorable because he has fun with the role. But it's Jack Nance that really leaves an impression. For those of you who don't know, Jack Nance was a David Lynch regular, starring in Eraserhead, and appearing in Dune, Lost Highway, and Twin Peaks. Here, he seems to be doing a more overtly creepy version of his character from that acclaimed TV show, and it's this character that sticks with you the most throughout the entire film. This is really a confounding film. I guess it was trying to be somewhat Lynchian (the presence of Jack Nance seems to confirm this), but the choice of subject matter leaves something to be desired. There's one scene that I think is indicative of the larger film. Gus is sitting on the sidewalk, peeling stickers off Motorama cards, looking for those elusive letters. A couple walks up and decides to use the back seat of his car as a place for a quickie. The action then cuts back and forth between Gus throwing away losing cards and the couple throwing away their clothes. Then Gus finds a letter, and goes insane with happiness, while the couple in the back finish up noisily. What's with this scene? It's not funny, it doesn't further the story, and it looks corny. Now, take this scene and stretch it out for almost an hour-and-a-half, and you've got Motorama pegged. Image Transfer Review: Motorama is available only in full-frame (at least the amount of headroom makes it looks like full-frame, but it could be pan-and-scan). I don't know why they couldn't have released the disc as a two-sided disc with full-frame on one side and widescreen on the other. Regardless, the film looks good, but not excellent. Colors are mostly faithfully reproduced, although I noticed that several scenes looked too dark. There were noticeable marks on the print used, and since the transfer is in full-frame, it's not anamorphically enhanced. Audio Transfer Review: The audio is not very good. In fact, it's muted for the most part. At least the score (provided by ex-Police member Andy Summers) was confined to playing at low levels in the background. In contrast, the dialogue seemed abnormally loud at times, to the point where it becomes annoying or startling if someone talks after a prolonged period of silence. Extras Review: The extras consist of a trailer for Joe Dirt. Some movies become famous. Others develop cult followings. Some only ever show up at 2am on some cable channel. And then there are those, like Motorama, who come and go without so much as a whisper, and eventually they end up on the doorstep of unsuspecting reviewers, who watch in amazement as they realize that someone actually had to make the film they're seeing in front of them. 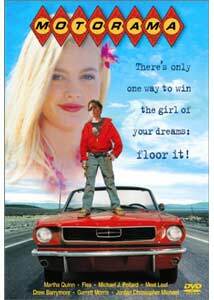 Despite the presence of the singularly spectacular Jack Nance, Motorama is a dud.